Last weekend I was in Florida visiting with friends and family. Two of my most trusted voices said they enjoyed when I posted the step by step building of a painting. So here are the steps to the completion of a portrait I did for a wedding gift. I sketched with blue pastel pencil. Then a more detailed drawing is done with blue acrylic paint on a canvas painted red. The white paint in the corner begins to tone down the red. More detail in acrylic paint. 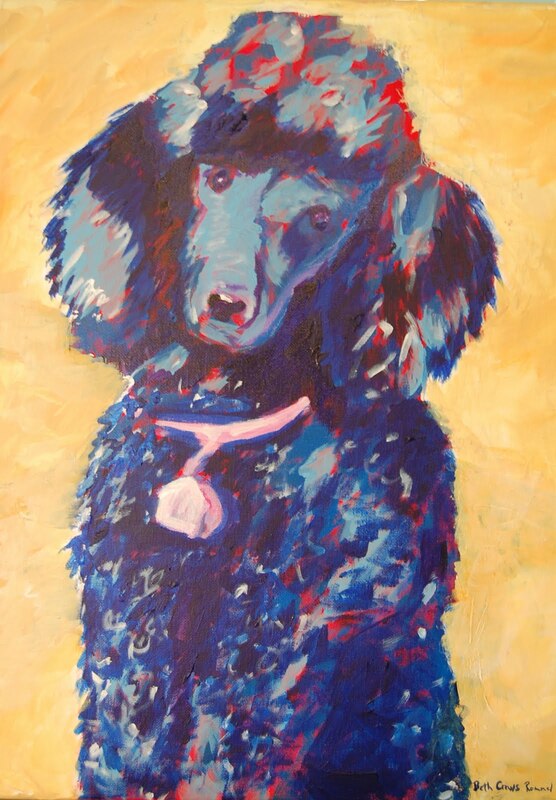 I have painted shadows on the poodle with different shades of blue. The background has its first layer of paint over the red. Eyes, collar and gold background are complete. My signature is the last detail. Seeing this painting in the young couple’s dining room last fall was like a big hug. For Christmas I wanted to give my daughter a painting of her cats, her big cats. She had wanted one for several years. The time was finally right. So I began with a large canvas, 30″ x 40″. I painted the background with a yellow gold acrylic, just to get started. I sketched the cats in with a pencil then started using my oil paints. The cats are the way I want them so it must be time to begin the background. I began to tear paper and form what would represent an Oriental rug and feline pillows. This is a meditative process for me. Tearing and fitting and gluing. The piece presents itself and unfolds as I go. Mia and her Big Cats. The background colors have changed. The cats are touched up and given extra texture and color with a fan brush. A few toy mice and a piece of string are added to the composition. I have been at a loss for words so have not been writing too much. I have been painting so thought a photo of the latest pet portrait would suffice. After all, a picture is worth a thousand words. If you are interested portraits are done by commission. You can contact me at beth@niftyartgirl.com for more information.